Lock in a great price for Quality Inn Ciudad Obregon – rated 8.2 by recent guests! Yes good continental braleakfast Were comfortable .thanks great job. THE HOUSEKEEPING LADIES WERE VERY FRIENDLY. BEST SERVICE I EVER HAD IT WAS FUN AND ENJOYABLE TO BE AT THE QUALITY INN HOTEL IN OBREGON. EXCELLENT SECURITY. IN THE RESTRAUNT I HAD THE BEST CREAM CORN AND CHEESE SOUP WITH BUTTERED BREAD THAT WILL MAKE ME GO BACK TO THE QUALITY INN. THE BREAKFAST BUFFET WAS PERFECT. This is our second stay at this hotel. We had a better room this time - king bed, located in the courtyard/pool area. There is air conditioning that is a bit noisy, but an asset none the less. Bed was very comfortable. There was a facecloth. This can sometimes be a problem in hotels in Mexico. I've learned to travel with one. Continental breakfast is good - yogurt, pancakes, cereal, ham, juice, etc. This is a sweet little motel for the price. The staff is very nice and accommodating. The conference room is excellent. The hotel cleanliness, the staff, the restaurant, and the room were great!! Nothing,but the front desk people are kind and helpful. Rooms are big and confortable. Staff was very nice and it has a great location. Calidad con relación al precio, en el restaurant buena comida, buena atención del personal. Quality Inn Ciudad Obregon This rating is a reflection of how the property compares to the industry standard when it comes to price, facilities and services available. It's based on a self-evaluation by the property. Use this rating to help choose your stay! One of our best sellers in Ciudad Obregón! Just 2,450 feet from Ciudad Obregon City Hall, the Quality Inn Ciudad Obregon offers an outdoor pool, gym and free private parking. Each air-conditioned room includes free WiFi and a flat-screen cable TV. The spacious, brightly decorated rooms feature a desk, a coffee machine and ironing facilities. Bathrooms include a shower, hairdryer and free toiletries. Quality Inn Ciudad Obregon has a lounge bar and a restaurant, where a free continental breakfast is available daily. Various international restaurants can also be found within a 5-minute walk. Other facilities at Quality Inn Ciudad Obregon include a business center and meeting facilities, which can accommodate up to 230 people. The Quality Inn is located just 1,000 feet from the Yaquis Museum and 2,650 feet from Ciudad Obregon Train Station. Shops, casinos and cinemas can be found around Plaza Goya Square, a 5-minute drive away. When would you like to stay at Quality Inn Ciudad Obregon? This more spacious, air-conditioned room features bright décor and includes free WiFi and flat-screen cable TV. It has a large work desk with an ergonomic chair, as well as a coffee machine and ironing facilities. The stylish marble bathroom comes with a hairdryer and free toiletries. 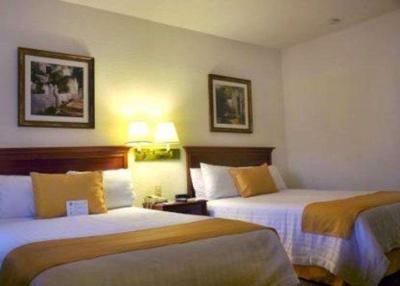 This air-conditioned room features bright décor and includes free WiFi and a flat-screen cable TV. It has a coffee machine and ironing facilities. The bathroom comes with a hairdryer and free toiletries. House Rules Quality Inn Ciudad Obregon takes special requests – add in the next step! Quality Inn Ciudad Obregon accepts these cards and reserves the right to temporarily hold an amount prior to arrival. Just one of waitress did see us. My family and I as a hotels guest, cause he asked us " are you all hotel guess?then I replied of course! . if we. Wouldn't be hotel guest, we wouldn't be there. Parking was way too over crowded. Security at gate didn’t check vehicles if they were guest. Bathrooms were small. Air conditioner was loud. Roachs were in the room. I personally don't like gated parking that causes extra steps to enter and exit. Also, in one of the rooms the air conditioning didn't function, causing one uncomfortable night. When it was reported, it was repaired promptly. he only aspect I did not like was the location of the room. The room I was assigned to was over the street and all the cars' and buses' noise was too loud to sleep. WiFi is available but you really need to use in the reception area. In the evening unable to connect, likely due to volume of users. This is a common problem in Mexico.